You are invitated to a Deale MD Open House Friday Sept 17 4-5PM! Homemade Bread and Salad! You are invited to a Deale MD Open House Friday Sept 17 4-5PM! Homemade Bread and Salad! Mark your calenders and see you there. Or contact Cheryl Ritchie, RE?MAX 100, for your own private viewing. 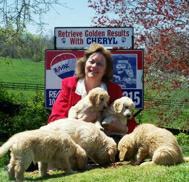 You'll Retrieve Golden Results with Cheryl Ritchie, RE/MAX 100. Here'a another Southern Maryland Best Home Buy!